If you're looking to get out of the heat I highly recommend going to see Mama Mia! Here We Go Again. McCray and I went on Saturday and loved it! Going to the movies has been one of our go-to summer activities because it has been too hot to do anything outside. 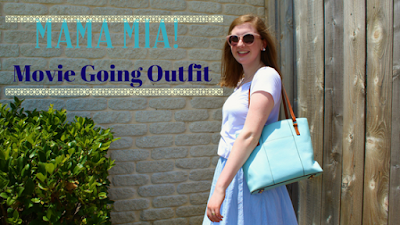 Here is my Mama Mia outfit that helped keep me cool in this heat while still looking cute! This outfit is perfect for a hot summer day, especially if you live in Texas like I do where we have had temps of upward 110! Although it is long, this skirt is so flowy that it keeps you cool in the heat. Throughout the post you can see that I have thrown my hair up and tied my shirt in a knot. I would like to say that was me trying to show you different ways I styled the outfit but really I just got very hot. I never tie my shirts but I tried it out and I think it looks really cute with the skirt. My shirt is a plain white v neck that you can get pretty much anywhere though I picked mine up while I was shopping with my grandma at Cato. My skirt is the same skirt I mentioned in my Dressing Room Try On and I'm wearing my brown and white Jack Rogers that I found at TJ Maxx last spring. I thought this Dooney and Burke handbag went with my outfit perfectly and I picked it up on sale at Dillard's a couple of summers ago. Tip! Dillard's tends to have a pretty good sale/clearance section in their handbag department and you can get a pretty good deal on a really nice purse just because its past season! What has been your favorite movie released this summer?